Facsimile of the first page of the law of May 31, 1875, regarding “the religious orders and similar congregations of the Catholic Church” [“die geistlichen Orden und ordensähnlichen Kongregationen der katholischen Kirche”]. (Note: “similar congregations of the Catholic Church” refers to communities comprised of clergy and lay members of religious orders living in the outside world – i.e., schools, hospitals, and missions – as opposed to monasteries and convents.) 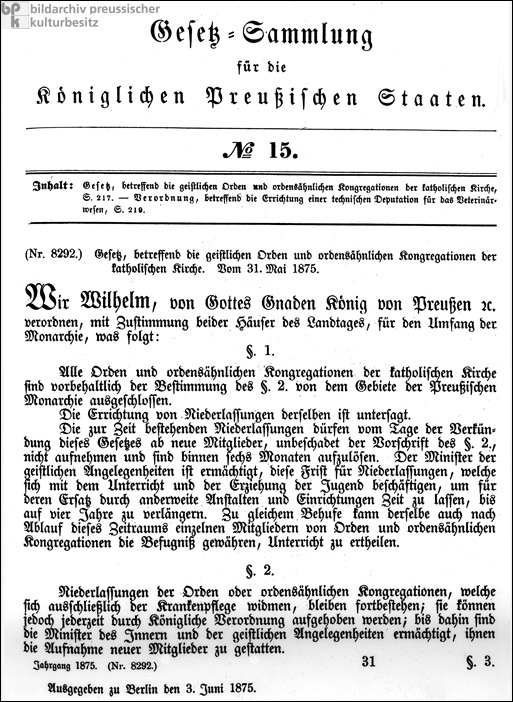 This law was part of the legislation behind Bismarck’s Kulturkampf [cultural struggle] against the authority of the Catholic Church in Germany. This facsimile was taken from Gesetz-Sammlung für die Königlichen Preußischen Staaten [Collection of Laws for the Royal Prussian States] (1875), p. 217.